Year-Round Fire Season Means Always Living 'Evacuation Ready' More people are living in places that are prone to wildfires. That means during fire season, they live with the very real possibility of having to evacuate on very short notice. 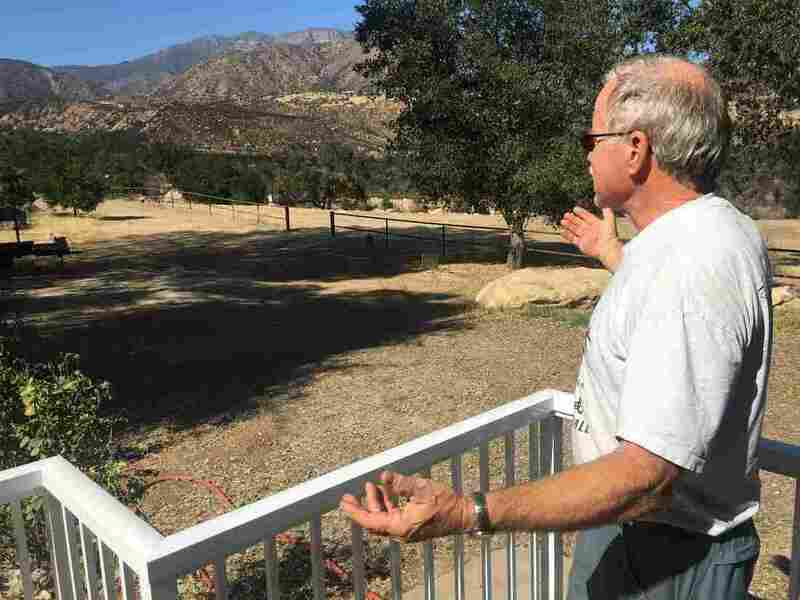 Rod Thompson lives in Ojai, Calif., where the Thomas Fire last December charred 440 square miles. Hurricane season means people on the Atlantic and Gulf coasts live with the possibility of evacuation for several months each year. But in the part of the country prone to wildfires, being ready to evacuate has now become a way of life with wildfires turning into a year-round threat. Last year, wildfires destroyed thousands of homes around California. And this summer, it happened again with wildfire devouring entire neighborhoods in the city of Redding. "We're getting surprised not just by the time of a fire in terms of the time of year, but also fires going into areas that you wouldn't traditionally even think were wildfire prone," says Tom Cova, a wildfire evacuations expert and director of the University of Utah's Center for Natural and Technological Hazards. Cova says development that's encroached into western wildlands and warmer temperatures mean Californians — including those who live in suburban neighborhoods — need to always be prepared. Rod Thompson learned that last year. He lives in a rural area of Ojai, in southern California, and the view from his back deck is postcard worthy. It's a coveted view that comes with a price. "Every 13 to 18 years, thereabouts, we get a wildfire up here," he says. None, however, as large as last December's Thomas Fire — a 440-square-mile wind-fueled firestorm that started about five miles down canyon. "We saw the glow, but the wind was blowing it kind of away from us and we thought no problem," Thompson says. But then, a second fire erupted under power lines in the hills just above his property sending "about a 60-foot rolling wall of flame" directly at his home. Thompson ultimately saved his house but lost several other buildings on his 1.5 acre lot. One of the buildings the fire destroyed was his his son's home. About a hundred other locals also lost houses as firefighters focused on an even bigger problem: wind-whipped flames had jumped from the hills of Ojai into the city of Ventura, where they raged through suburban hillside neighborhoods, destroying more than 500 houses. We have fires starting in January all the way through December. Last October, Sudeep Motupalli Rao of Santa Rosa and his wife had no idea that a massive and deadly wildfire was raging through their city as they slept. They first learned about it the next morning when Rao looked out the window and saw a "giant wall of blackness" approaching his neighborhood. "We quickly turned on the news," Rao says. "It had spread real fast and we were wondering how do we navigate through this situation?" California fire officials say that's a question they're urging all Californians to ask before wildfire strikes. "We have fires starting in January all the way through December," says Scott McLean, deputy chief with Cal Fire. "The deal that we're seeing this year is the consistency of large fires that keep starting, keep starting, keep starting." Being evacuation ready, McLean says, includes signing up now for emergency cell phone alerts; keeping your car filled with gas; planning ahead what items you'll take with you — pets included — and, considering what to do if things turn ugly and evacuation isn't an option. In 1991, Cova was among those evacuated during the deadly Oakland Hills wildfire. Many who died in that firestorm were trapped on traffic-clogged streets. "People need to be ready for everything from 'It's very easy to get out.' to 'They can't get out at all,'" Cova says. If you do get trapped in a wildfire, jumping into the nearest swimming pool or taking shelter in a parking lot or sports field can mean the difference between life and death. But the preferred plan, Cova says, is to evacuate before a situation becomes dire. "Wildfires do come with some warning, even though we don't think they do," he says. The most obvious warning signs are high temperatures, low humidity and strong winds. That combination triggers something called a "red flag warning" by the National Weather Service. And in the West, local news stations broadcast those warnings as regularly as weather reports. Rod Thompson in Ojai says, beyond clearing brush, his wildfire ready plan includes getting his wife and granddaughters to safety and always keeping a wildfire go-bag of sorts. In it, he says, go just the essentials: namely family photos, important documents and research for a book he's writing. "I don't take, you know, any of the valuables. So what?" he says. "That's replaceable, but these things are irreplaceable: Pictures, family pictures, albums — and they go." Rao of Santa Rosa has a similar plan. "We would collect some essential things, like family (photo) albums ... passports, documents, computer," he says. And next time, he says, he'll be sure to also take a collection of letters his mom wrote to him while he was in college. "On the back of each letter she also wrote a recipe," says Rao. "So I laminated all those and made it into a book, I don't want to lose that. That's part of family history."